And above the words "Adventurer's Inn" didn't the sign show the figure of a black-hatted pirate holding a sword in his mouth? his cutlass(His large sword)..he also wore a patch over one eye. Good memories down there from Kids TV Kid. I went to the same one. in The Coney Island Section of Bklyn,NYC. "Nathan's Famous"was in Oceanside..not Freeport..UncleKispy. I moved to Mt. Vernon and then Eastchester after leaving the City, so I 've been to the Yonkers (Central Ave.) Nathan's many times with my kids (they played in the back with all the video games and pinball machines). I, too, used only ketchup on my dogs, burgers and fries ! I always liked the access to the condiments as well ! When I use to go to Nathan's on Central Ave in Yonkers,New York with my family..The mustard and ketchup were in big metal tubs and you had to spoon it out with long stemed spoons.There were also tongs for saurkraut. I prefered to put ketchup on my burger,hot dog..and when I use to eat them..my fries. I always had a large coke and a soft serve ice cream in a cone..these days I no longer eat fries and I prefer Diet Seven Up or Sprite 0 to Coke. There was also a penny arcade..where you can play games,get your fourtunes from a few fortune telling machines and even see a "Three Stooges"comedy on a movie machine"A Bird In The Head" with Moe,Larry & Curly".My brothers and I would play the games..after we ate and I would also get my fortunes from the fortune telling machines. Sadly that penny arcade and that type of Nathan's is gone..a smaller one now stands in that neghiborhood. We drove from Flatbush to Coney Island to the original Nathan's. Our relatives moved to Long Island and they erected a big Nathan's, originally under a huge green tent, in Oceanside ( or Freeport ? ) if I remember correctly. The "forks" were 2 pronged and made of wood. The french fries were the greatest....as were the dogs !!! Today they are sooooo overpriced !!!! I moved from NYC to northern CA in 1975. For a while, we had Nathan's hot dog and Carvel ice cream franchises out here, but they didn't last long. Went to Coney Island this past Memorial Day, on the D Train. Rode the Cyclone and had a Nathans Hot Dog. 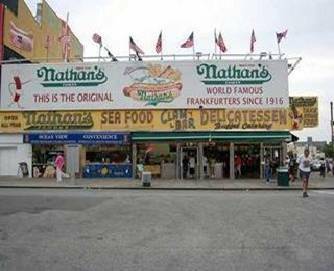 fyi...The ONLY place to buy/have a Nathans hot dog is the original location at Coney Island, Brookyn. NYC. Forget about that packaged crap sold in supermarkets as Nathans hot dogs or any freestanding locations called Nathans. Just ain't the same.